A composite image of various digital ads that ran in the lead-up to the 2018 general election. When you opened your mailbox, watched television or listened to commercial radio in the lead-up to the election, you and other would-be voters were likely bombarded by political advertisements. Like in elections past, some of those materials were paid for by candidate committees and are easily identified as such. But the sources of the materials from other groups -- known as independent expenditures and not authorized by a candidate or a candidate committee -- are often more difficult to discern. Advocates for campaign finance reform say current state law falls short in enabling the public to track who is funding some of these groups in a centralized and uniform manner. “We have all of these groups that are reporting to the Secretary of State’s office. But I think it is important to note to that these reports don’t tell us a whole lot as to who is behind these groups. Some of these groups don’t disclose who is making contributions and those who do use shell corporations or other means to keep things in the dark,” said Julie Archer of West Virginia Citizens for Clean Elections. Tracking state-level spending by federally registered groups can be difficult. Some of these groups use loopholes in West Virginia’s campaign financing laws to avoid disclosing donors and expenditures to the Secretary of State’s office. In addition, federal campaign finance law does not require these groups to disclose details regarding the candidates or races they targeted in state-level races. During the 2018 general election cycle, independent expenditure political action committees registered in West Virginia spent more than $5.4 million to meddle in House of Delegates, Senate and Supreme Court races. That figure only represents expenditures filed with the West Virginia Secretary of State’s office. Union-backed, pro-Democrat groups represent a significant chunk of independent expenditures this election. Mountain State Values focused mostly on House of Delegates races, while WV Patriots for Liberty exclusively targeted state Senate races. Mountain State Values received more than $1.8 million in total contributions for the 2018 midterms. These donations came mostly from labor-backed political action committees and organizations, including the American Federation of Teachers’ Solidarity fund, the West Virginia state Building & Construction Trades Council, the Mid-Atlantic Laborers Political Education Fund, the West Virginia AFL-CIO, and the AFT-West Virginia Committee on Political Education. Mountain State Values targeted 18 of the 67 districts in the House of Delegates and on one race in the state Senate -- District 17 -- by spending money opposing incumbent Tom Takubo and supporting Terrell Ellis. Takubo won the race by more than 4 percentage points. 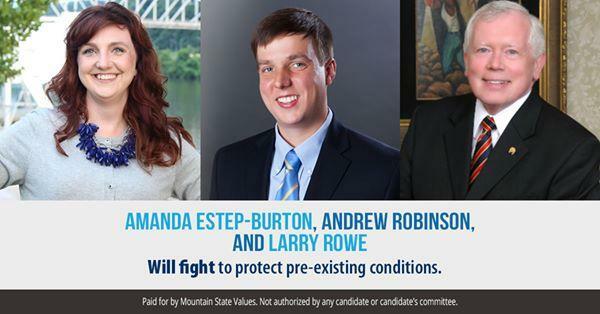 An ad from Mountain State Values supporting House of Delegates 36th District Democratic candidates Amanda-Estep Burton, Del. Andrew Robinson and Del. Larry Rowe. They all won election in the three-member district. WV Patriots for Liberty took a similar tactic in fundraising but spent funds differently. The group raised more than $1 million from trade unions, including the International Union of Operating Engineers Local 132, the Engineers Political Education Committee and the West Virginia State Building & Construction Trades Council. Every bit of $832,561.38 spent by WV Patriots for Liberty went to oppose Republicans running for the state Senate in five districts -- Ryan Ferns (District 1), Eric Tarr (District 4), Mark Maynard (District 6) Ed Gaunch (District 8) and Mike Oliverio (District 13). Ferns, Gauch and Oliverio were defeated; Maynard and Tarr won their races. Neither group responded to requests for comment about their respective donors and spending. Former U.S. Attorney and one-time gubernatorial hopeful Booth Goodwin is listed as director of Re Set West Virginia. Filings by the group list the National Education Association, West Virginia Strong, Inc. and Expanding West Virginia Opportunities as major donors. The organization focused on the state Senate’s 10th and 17th districts and six races in the House of Delegates -- districts 12, 16, 21, 63, 65 and 67. In total, Re Set West Virginia spent $178,337.19 supporting Democrats and opposing Republicans. Goodwin said his motivation to start the group was to make a push for Democrat candidates from within the state. He also deemed the efforts successful. “Nearly half of the candidates that Re Set West Virginia endorsed ended up winning — even in some really tough races. We plan to do even better in 2020 in order to put the state’s politics back in the hands of leaders who are not beholden to extreme and out-of-state interests,” Goodwin said. Two pro-Republican organizations delved into the 2018 general election but have yet to fully disclose from where their donations came. As a result, they have drawn attention from the West Virginia Secretary of State’s office for those practices. 1863 PAC -- which initially sprung up to support Del. Roger Hanshaw’s bid to become House Speaker -- spent $281,182.33 in support of Republican House of Delegates candidates and opposed Democratic rivals. However, the group has not listed its donors on filings with the Secretary of State’s office. Luke Thompson, a New York-based political consultant who serves as executive director of 1863 PAC said the group is in compliance with state campaign finance law. “1863 PAC received several contributions from several hundred organizations and individuals -- from numerous sectors of West Virginia’s economy -- who agreed with our mission of protecting the Republican majority in the House of Delegates and protecting the speakership of Roger Hanshaw,” Thompson said. “No contributions were above six-figures and a majority of contributions were in the three-figure range,” he added. But public filings don’t specify where that money came from. Less than two weeks before the election the Charleston Gazette Mail reported that the Secretary of State’s office issued a cease and desist order to 1863 PAC, citing no registration as a state or federal political action committee. Many questions about the group’s origins and efforts have centered around Riley Moore, a Republican delegate from the 67th House District who was ultimately defeated in the 2018 midterms by Democrat John Doyle. Thompson said the idea for the group came from Moore and Hanshaw. In an interview with West Virginia Public Broadcasting, Moore disputed that characterization, saying the organization’s board created the group and dictated its focus. Hanshaw said he was told of the 1863 PAC’s establishment by Moore and said he had no involvement. Thompson also said he and Moore coordinated on fundraising efforts, which Moore confirmed. Moore has weaved back and forth on explaining his involvement, affiliation or knowledge of anyone at 1863 PAC. First, he told WVMetroNews he had personal relationships with those involved with the group. Later, the Gazette-Mail reported Moore denied affiliation with 1863 PAC and declined further comment. “I certainly encouraged somebody like Luke to get involved in West Virginia. He’s been involved in Republican politics throughout the country for a long time,” Moore told West Virginia Public Broadcasting. Hanshaw recently became House Speaker, putting Moore in line to take over as majority leader at the beginning of the 2019 legislative session. Moore and Thompson both say Moore was not involved in spending decisions made by 1863 PAC, which is in compliance with the state’s campaign finance laws. Thompson pointed out that pro-Democratic independent expenditures far outspent those who aimed to help Republicans and, therefore, deemed his group’s efforts successful. He cited losses by Democratic incumbents such as Scott Brewer, Richard Iaquinta, Dana Lynch and Ricky Moye. “We counterpunched in a year we were supposed to be on defense and the results speak for themselves,” Thompson said. An ad from 1863 PAC in support of Del. Riley Moore. 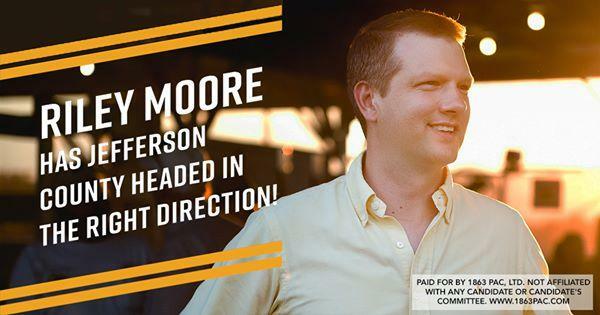 Moore, who was in line to become the next majority leader, lost to Democrat John Doyle in the 2018 general election. Thompson noted that 1863 PAC used a targeted texting campaign -- known as peer-to-peer or P2P -- as part of its strategy. That tactic drew a lawsuit from Jefferson County resident Mariah Norton, who says she was spammed by text messages in support of Moore. Norton and her attorney -- former Democratic House of Delegates member Stephen Skinner -- say those texts were in violation of Telephone Consumer Protection Act. The Secretary of State’s office also cited another organization for election engineering activity during this past election cycle: Shale Energy Alliance. The group was also issued a cease and desist order for not registering as a state or federal political action committee. Republican Del. John Kelly filed a complaint against Shale Energy Alliance, which prompted the cease and desist. According to the Charleston Gazette-Mail, Kelley said the group is funded by natural gas company EQT Corp. and that they targeted him in the May primary for not running legislation the company was supporting. Kelly is the vice chairman of the House Energy Committee. Shale Energy Alliance spent $69,759.25 supporting Republicans in a handful of races between the House and Senate in the general election. Representatives of Shale Energy Alliance could not be reached for comment. Republican state Senate hopefuls -- and even some off-ballot incumbents -- got help this election cycle from a independent expenditure known as West Virginia’s Future PAC. Public filings show the group supported GOP candidates and opposed Democratic rivals. Notable donors to West Virginia’s Future PAC leading up to the 2018 midterms include Republican Gov. Jim Justice and Cary Communications, a company owned by media mogul and Justice senior advisor Bray Cary. Each contributed $50,000 to the committee. Coal company Murray Energy contributed $72,000 and donations from beer distribution companies around the state totaled more than $10,000. According to expenditures filed with the Secretary of State’s office, West Virginia’s Future PAC offered support to Republican Senate candidates Ryan Ferns (District 1), Eric Tarr (District 4), Ed Gaunch (District 8) and Tom Takubo (District 17). The committee also spent money to oppose Democrats in those same races, including William Ihlenfeld (District 1), Brian Prim (District 4), Richard Lindsey (District 8), and Terrell Ellis (District 17). They also spent money to oppose Bob Beach (District 13), John Unger (District 16). Republicans will still hold a majority in the Senate -- but based on results in races that West Virginia’s Future PAC targeted and tried to influence, the only Republican winners were Tarr and Takubo. An attorney representing West Virginia’s Future PAC did not respond to a request for an interview. The Republican State Leadership Committee -- a federal 527-organization with no cap on donations or expenditures -- spent money on candidates in 12 House of Delegates districts and one contest in the state Senate. Of the $45 million the group says they spent in the 2018 general election, $150,000 was dedicated to West Virginia statehouse races. RSLC president Matt Walter said that the group targeted those contests in a calculated manner. “The first thing we do is determine what the macro environment looks like -- what the likelihood of races changing and what those target districts are -- so narrowing down to where the competitive races are going to be. And then sharing information with the voters of West Virginia to help them understand what the candidate stands for, and how they’ll govern once they get into the state Capitol,” Walter said. “Depending upon the region of the state -- and the composition of the district -- we are picking the most convenient and appropriate communications method to share that information with voters,” he added. Ultimately, the RSLC appears to have been successful in a majority of its efforts. While the RSLC focused on a small number of legislative races, the bulk of the group’s spending was directed toward electing prominent Republicans to the West Virginia Supreme Court of Appeals -- although seats on the state’s high court have been non-partisan since 2016. The committee’s Judicial Fairness Initiative spent a total of $1,749,319.98 between former West Virginia House Speaker Tim Armstead and former Congressman Evan Jenkins in their respective bids for a seat on the court. According to the Secretary of State’s website, both remain registered Republicans. Both candidates won their respective races, with Jenkins handedly winning Division 2. The RSLC’s spending on the state Supreme Court special elections -- which was more than 10 times what they spent on legislative races -- was a matter of the breadth of voters they wanted to reach, Walter said. “When you're talking about two statewide races with multiple candidates within each of the divisions -- and a state with very expensive media costs at a statewide level, given obviously the competitive U.S. Senate race and and all the activity you had during this election -- it's just more expensive to run those statewide races,” Walter explained. West Virginians for Fair Courts was another group that got involved in the two state Supreme Court races. The group -- funded in part by West Virginia Citizens against Lawsuit Abuse and the American Tort Reform Association -- supported Armstead, Jenkins and “several candidates.” The group spent $334,702.11 in total. Of that figure, $250,640.11 was spent specifically on Armstead or Jenkins. Of those expenditures, West Virginians for Fair Courts paid television stations WVVA, WTOV, and WDTV to air a 30-minute program featuring Gov. Jim Justice and his senior advisor Bray Cary. The program, titled Perfect Storm, showed Justice and Cary discussing the effectiveness of Republican policies and boosted Armstead and Jenkins. The video was promoted by and West Virginia Republican Party and was also shared on their Facebook page. Also notable in the races for Supreme Court, Berkeley County resident William Stubblefield spent $6,639.63 in support of Division 1 candidate Chris Wilkes. Independent expenditures mentioned thus far in this report show the activity of groups filing with the West Virginia Secretary of State’s office, but there are other groups trying to sway statehouse races that may or may not be registered with the Federal Elections Commission. As a result, no centralized agency can track these disclosures in any uniform way. For example, the Working Families Party noted in a news release following the 2018 general election that they spent $50,000 supporting Democratic candidates in four West Virginia Senate races and more than two dozen in the House of Delegates. The director of the West Virginia independent expenditure campaign, Andrew Cockburn, said election officials told him not to bother filing disclosures with the state. “I knew we had to report to the FEC and [the West Virginia Secretary of State] told me that since I was working with a federal PAC, basically, to get lost. They said they had lots of things to do, and they didn’t need some extra paperwork that was not required under state law,” Cockburn said. The group is registered as a political committee with the Federal Election Commission and, therefore, is not obligated to detail its financials with the West Virginia Secretary of State’s office. Another group known to have made independent expenditures in West Virginia statehouse races is Grow WV, Inc, another political committee registered with the Federal Election Commission. Grow WV Inc. also made independent expenditures in West Virginia statehouse races in 2018, but public filings with the Federal Election Commission from the group do not detail the candidates they targeted. A 2014 investigation by the Sunlight Foundation found that officers with the group also held executive committee positions with the West Virginia Republican Party. Officials with Grow WV could not be reached for comment. Pushing for more transparency in donor and expenditure disclosures would require action from the Legislature. Chuck Flannery, the deputy Secretary of State and the office’s general counsel, acknowledged loopholes in state law that prevent independent expenditure disclosures in state-level races from being able to be compiled in a centralized and uniform system. “The West Virginia Secretary of State’s Office stands prepared to assist the Legislature in addressing campaign finance laws to get disclosure standards uniform for independent expenditures and advocate for the electronic filing of the reports to allow a quicker and more transparent access to the information to the public,” Flannery said. Julie Archer of West Virginia Citizens for Clean Elections said closing loopholes in state campaign finance law are among the group’s priorities. “We have been and we will continue to push for increased disclosure and transparency in who is spending money in our elections,” she said. The Legislature’s next regular session — where many lawmakers who benefited from independent expenditures now have the ability to push for campaign financing reforms — begins Jan. 9.